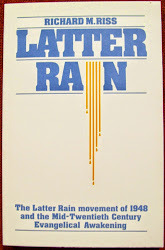 The Latter Rain Movement of 1948 started in Saskatchewan, Canada. The next place where it really made an impact was Vancouver, British Columbia. 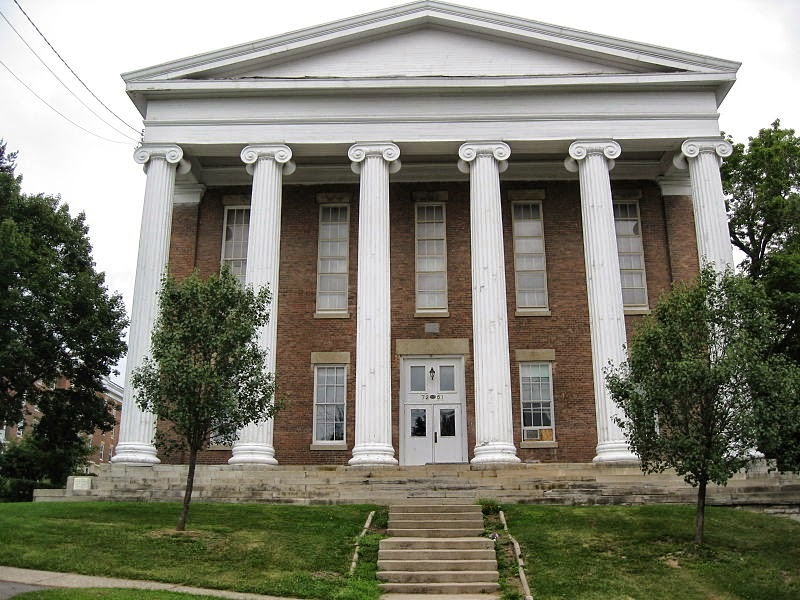 But it gained its greatest fame in Detroit, Michigan at a church pastored by a woman; it was called the Bethesda Missionary Temple and it was egalitarian before egalitarian was cool. 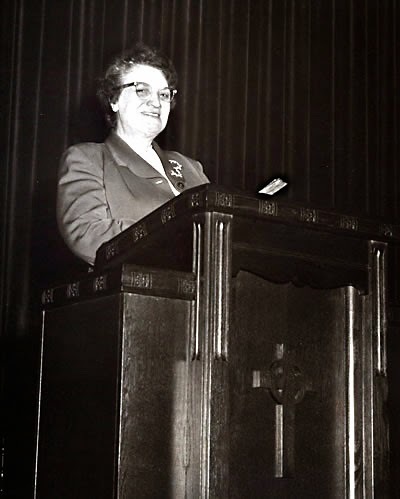 The woman pastor was Myrtle Dorthea Beall (1894 - 1979). 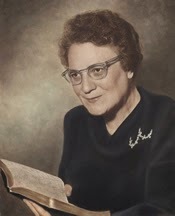 In most of the literature about her she is called M. D. Beall, but to those who loved the ministry of God through her she was known affectionately as Mom Beall. 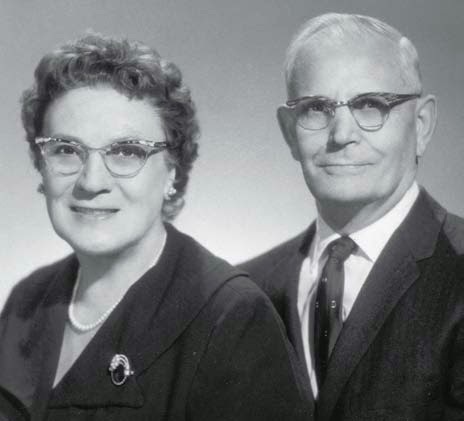 She was also called Mom Beall because she was recognized as a mother of the Latter Rain Movement. Some even say she was the mother of the LRM. They mean by this that God had given her a sort of matriarchal care of the movement. 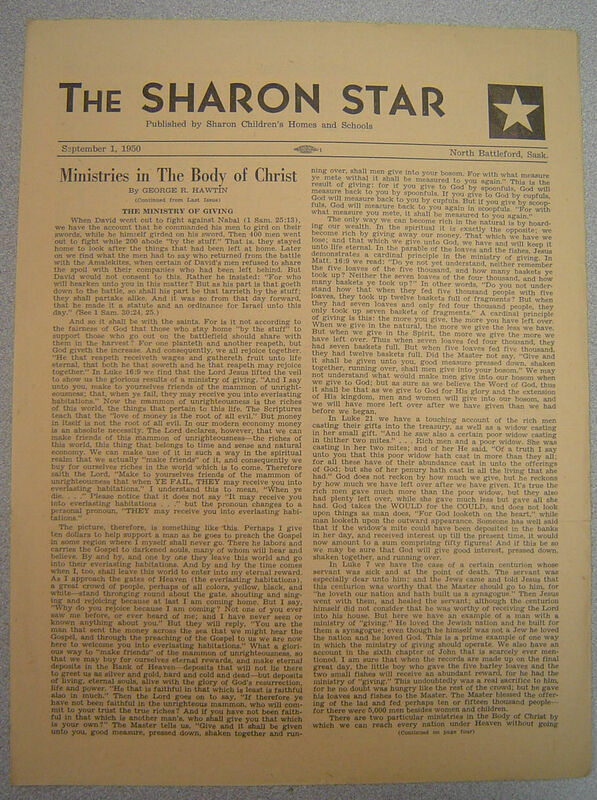 While the churches that were affected by the revival were never federated in any formal way, many looked to M. D. Beall and her church for leadership and sometimes covering. 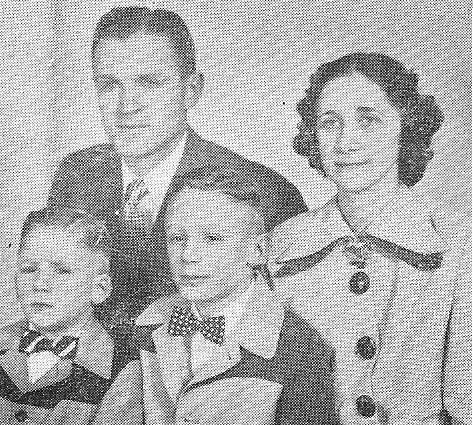 Mom Beall became a pastor in an uncommon way. First of all, she never had any formal theological training. She was simply a wife and a mother of three children who knelt down in her kitchen one day and was baptized in the Holy Spirit - that's right, speaking in tongues right there in the kitchen. When she innocently told others about this wonderful experience some were alarmed and more than once she was made to feel unwelcome in a church. So, she made arrangements to start a Sunday School for her children and others in the neighborhood in a building formerly used by a tire store. That was way back in 1934. 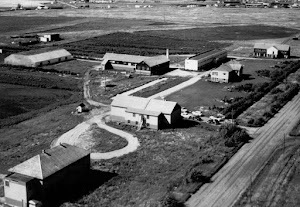 With the bombing of Pearl Harbor in December 1941 Bethesda began to pray both for the safety of the young men of their church who were enlisted in the war effort and for revival. God answered those prayers and not one Bethesda life was lost on the battlefields. And seven years to the month later, Bethesda's prayers for revival were answered in a most dramatic fashion. 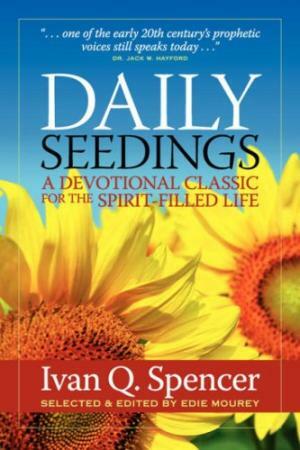 "Everything we saw in the meetings was scriptural and beautiful. We left the meeting with a new touch of God upon our souls and ministry. We certainly feel transformed by the power of God. Never in our lives had we ever felt the power of God as we do now and we feel we are carrying something back to our assembly we never had before. "December 5, 1948 was a turning point in the [life] of every Bethesdan. That Sunday morning everyone was gathered for church in the basement building. 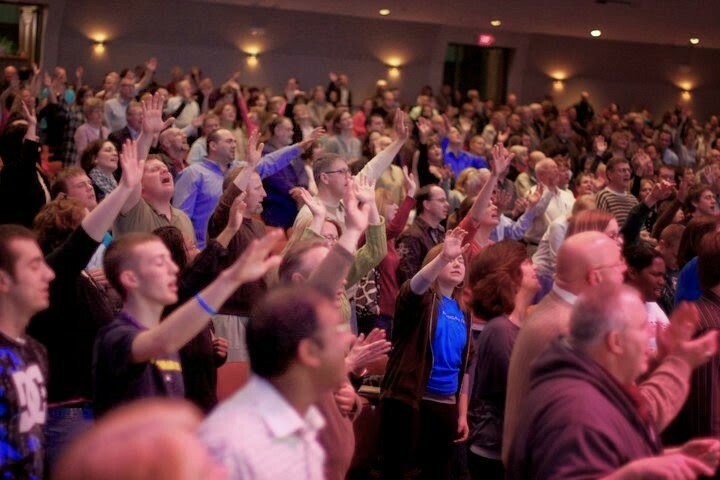 Opening the service, James Beall asked everyone to stand, and suddenly everyone in the building started singing praises to God in the Spirit .... this continued for about an hour. People were saved, filled with the Holy Spirit and healed in their bodies during this time. 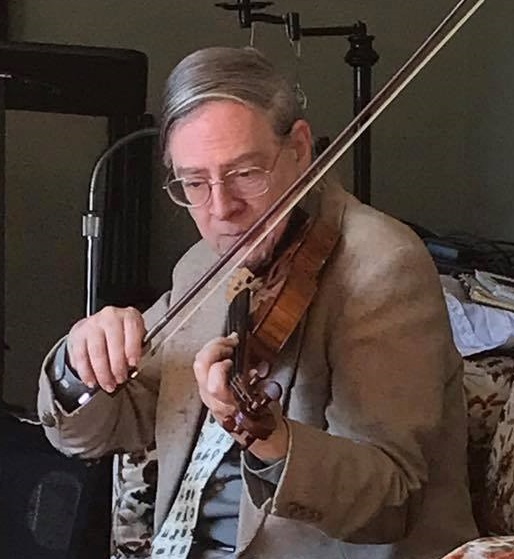 As the praise subsided a new song was born. Lift up your eyes behold the ripening grain. 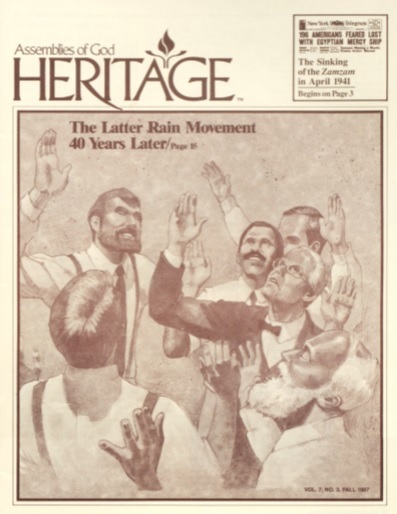 "That Sunday marked the beginning of what came to be known as the Latter Rain Revival. 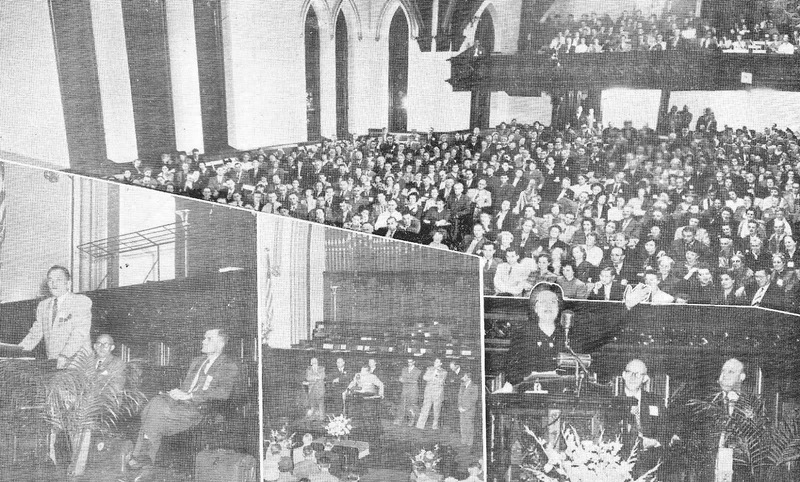 "Two months after this, on February 13, 1949 the main sanctuary [seating about 1,800] was dedicated. 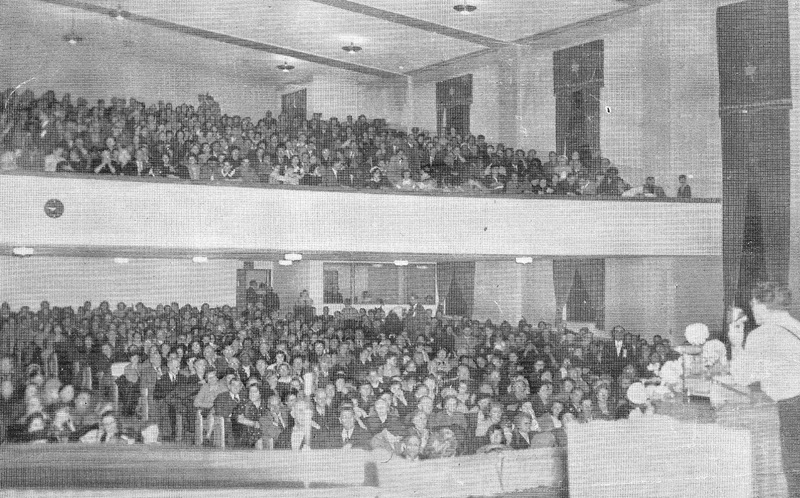 When the doors opened, it was immediately filled and at least 1,700 people were turned away. 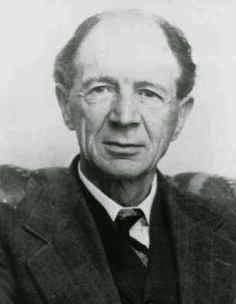 Services were held night and day for the next three and one half years." "Ivan and Minnie had arrived in Detroit and were soon ushered into the basement sanctuary of Bethesda Temple. As they became aware of the hundreds of people on their faces crying out to God in humiliation and brokenness, they knew that God was in the place. Says Minnie, 'The Scripture, 'Break up your fallow ground,' was being enacted before our eyes.' They, too, fell on their faces, and the Spirit wrought a work in their hearts that was new, and made them new. 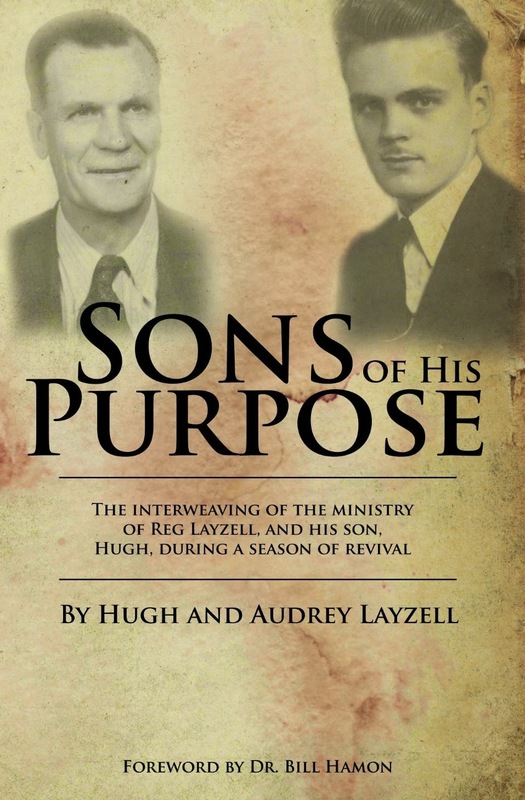 "In those days spent in the Temple, with little thought of meals and mundane duties, they witnessed marvelous depths of spiritual victory - manifest in conversions, baptisms, healings, deliverances, and impartations of gifts and ministries by the laying on of hands. Holy spontaneity replaced special programs, though there was much teaching. Prayer groups met as early as five in the morning, continuing into the afternoon. And it was easy to pray - one wanted to do nothing else. 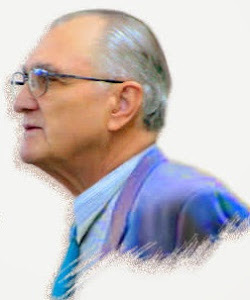 "'The 'new order' Latter Rain Movement in reality is giving us nothing that is new in spite of the claims of its advocates,' wrote General Superintendent Ernest S. Williams. 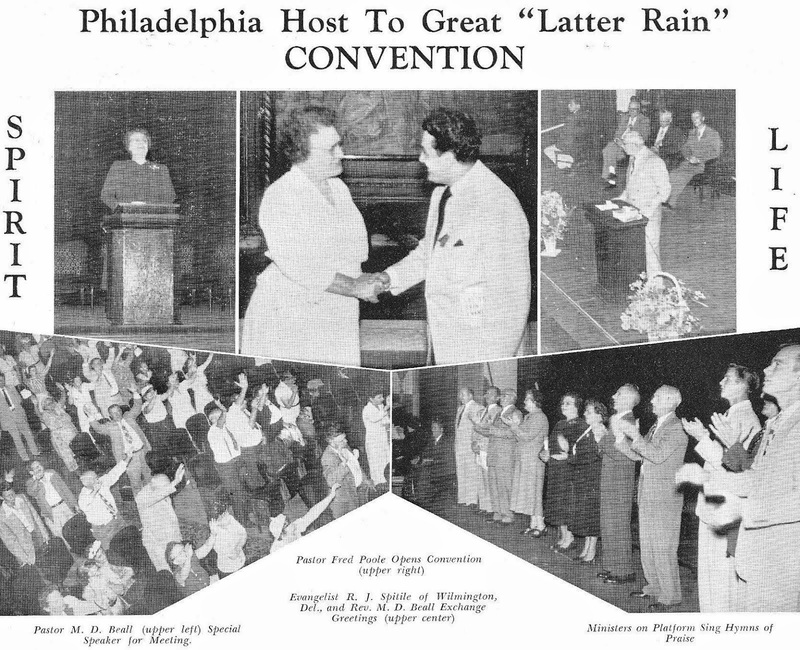 For Williams and his colleagues, Latter Rain practices pointed backward to problems that had once vexed the stability, unity, and spiritual integrity of the Pentecostal movement. Neither could the proper interpretation of Scripture justify the teachings of the new movement. 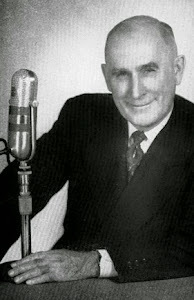 Since December of 1948 Bethesda has been known for, among other things, what Pentecostals and Charismatics call "singing in the Spirit". 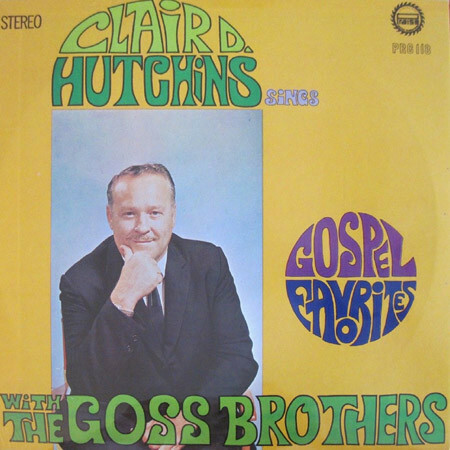 The beautiful, harmonious strains of a congregation with each member singing their own spontaneous song to the Lord came to be identified by some as sounding like a "heavenly choir". 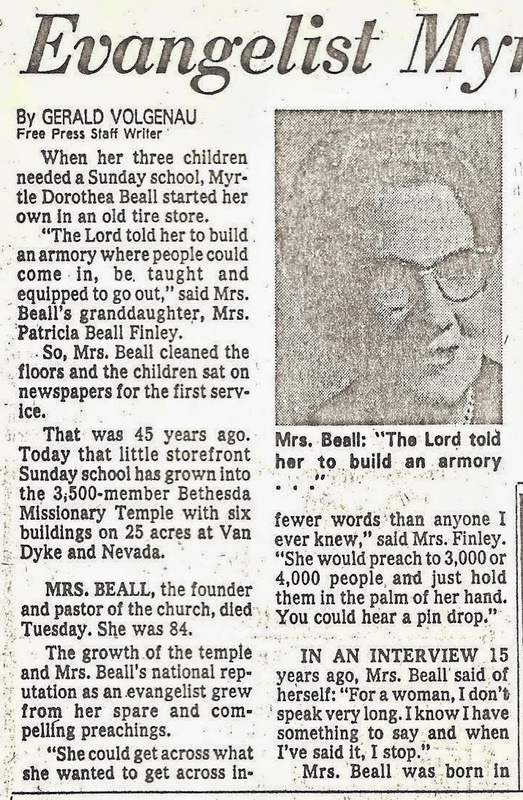 For her part, Mom Beall's preaching was unique. It was unique for its brevity as she typically spoke about 15 minutes (imagine that!) It was also unique for its riveting quality - she was a marvelous story teller. And most importantly it was memorable for its spiritual impact. I remember listening to her preach and at once wanting to cry and wanting to laugh for joy. 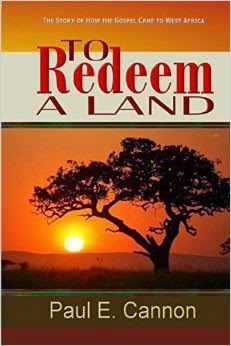 I felt as though I wanted to burst as the anointing on her words dropped into my spirit like nuclear bombs. "Although Mom was over eighty she now looked shot full of the most powerful energy in life." She was, Peter, she was. 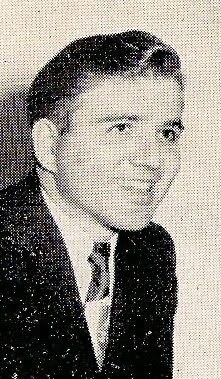 Mom's husband was Harry Lee Beall. 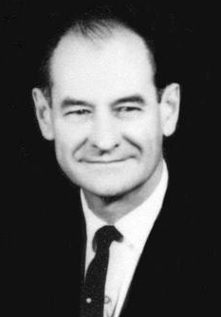 Mr. Beall was not a preacher but was supportive of his wife's ministry. 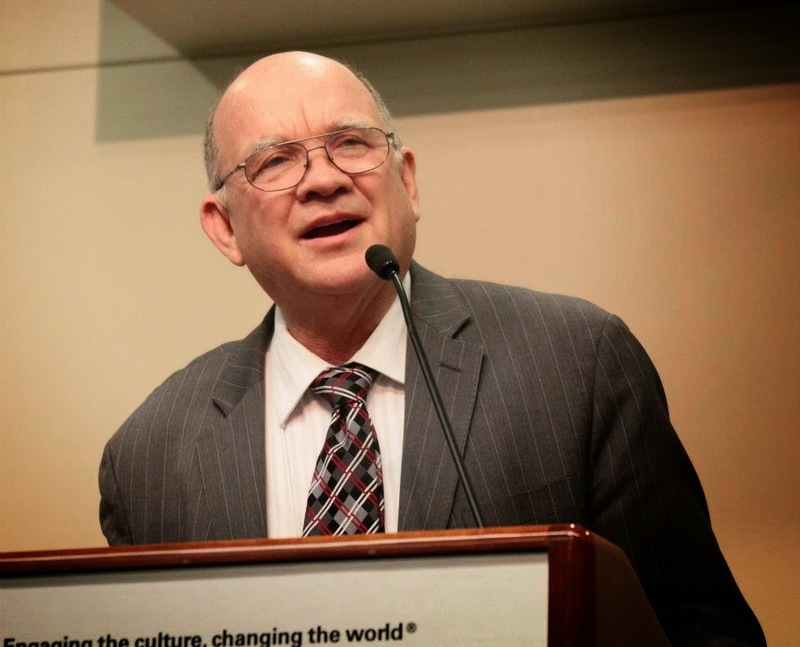 "Dad was the builder, mother the pastor," James Beall told the Detroit News in an interview after his mother's death. 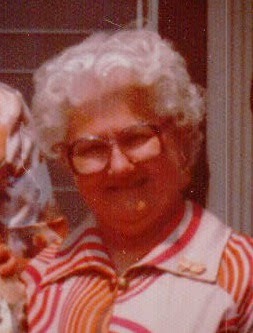 Besides James, her children included Patricia Beall Gruits and Harry Monville Beall. 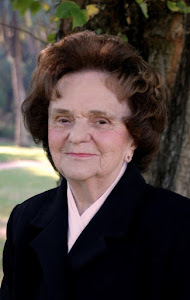 Patricia, now 90, is the author of a very popular catechism called Understanding God, as well as the leader of a missions organization in Haiti called Rhema International. 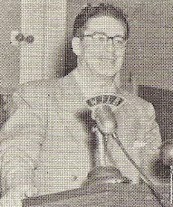 Harry was a preacher, soloist, and director of Bethesda's choir and orchestra. In the video above Mom Beall is seen speaking at 1:46 ... Patricia Beall Gruits is seen at 3:08 ... James Beall speaks at 3:34 ... and Analee Dunn speaks at 7:29 ... Patrick Visger is seen at 5:33. Thank you so much Archibald for your extensive research and post. Having been one of many thousands who have been blessed by the ministries of some of these men and women of God I can attest that their spiritual children, grandchildren, and great grandchildren continue to seek Christ exalted today. We stand on the shoulders of these faithful servants of Jesus and by the grace of God continue to lead others to a saving knowledge of the risen Savior Jesus Christ. Every generation has a watchword, a song, an emphasis that they rally behind when God moves afresh. We just need to remember, it's not new, it's His faithfulness to every generation when we humble ourselves and seek Him. Thanks Dave and I wholeheartedly agree with your comment. I was born in Detroit on January 3, 1950 in the middle of the Holy Spirit outpouring at Bethesda Missionary Temple where my parents Murlin and Charlene Juanita Ballard Grice were gloriously born again in 1949 and.where they attended and served faithfully as they raised 7 children, until they retired and moved to Tennessee in 1985 to fulfill their calling to minister. 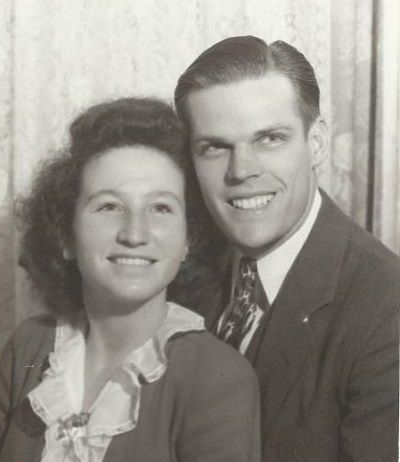 Mom and Dad had received prophecy in their early days of the Latter Rain outpouring as a young married couple to prepare for ministry and were called to a ministry of the "helps". 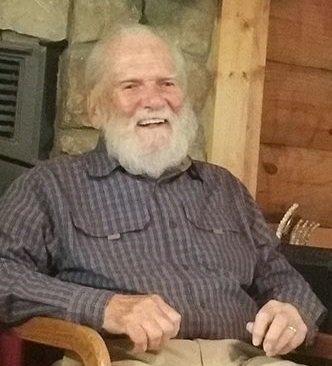 My parents helped many in the congregation over the years as they taught and ministered as both Deacons and then Elders right up to they day I drove their belongings to Dickson County Tennessee where Dad will turn 99 in October. 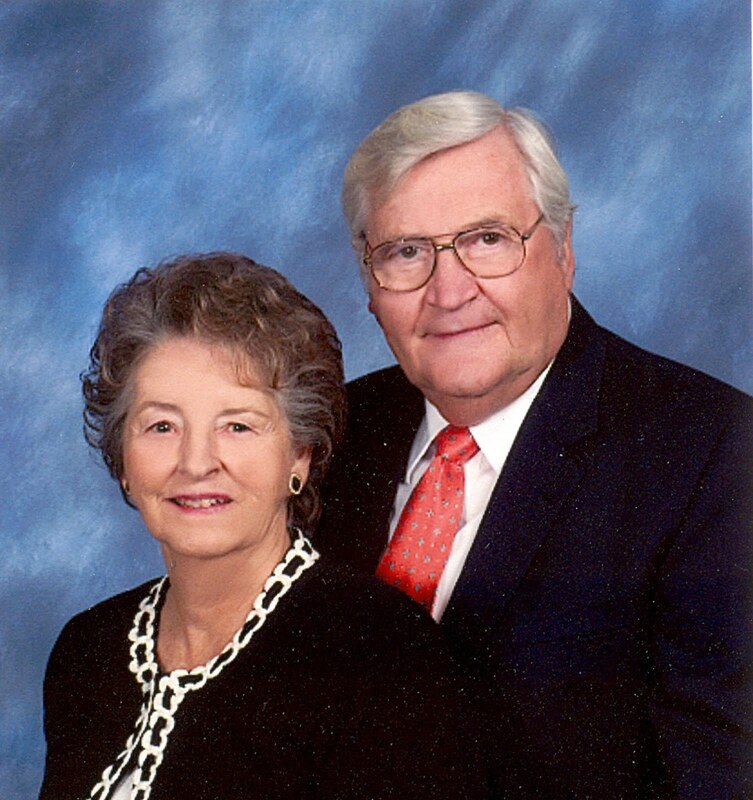 Murlin and Charlene Grice became pillars of a new congregation called Restoration Church in Dickson and were highly esteemed and greatly loved by one and all as they held home care group meetings and helped.build the new building next to Dickson High School. 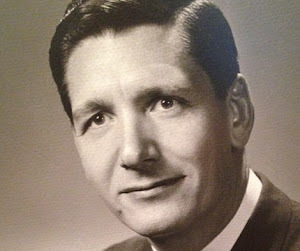 Dad not only visited the sick and disabled with Mom all across middle Tennessee as they had done for 40,years in Michigan but they arranged and cared for two of their own children with disabilities as Dad fearlessly shared the Gospel as only an 80 year old can do and still does to this day at 98. 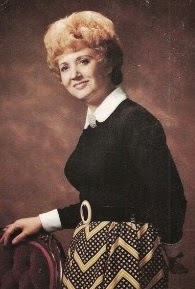 This lifetime of service and ministry began after a pregnant 25 year old girl from Camden Tennessee begged her tough red neck husband from Paris Tennessee to take her to visit the church that had a daily radio broadcast entitled "America to your Knees",and was telling about miracles signs and wonders. 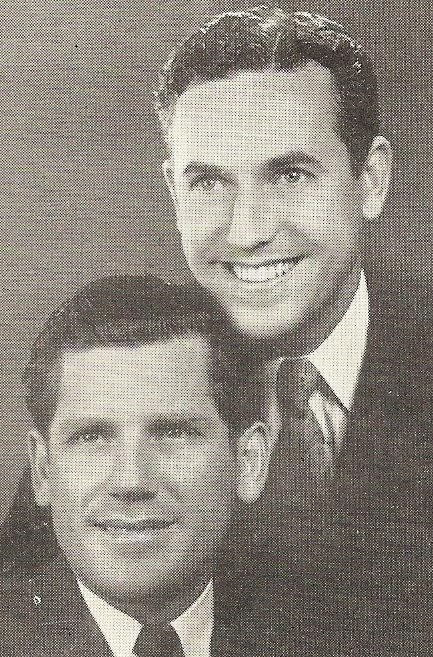 Dad was healed of a stomach condition that caused his early discharge from the Navy in 1941, was delivered from a lifetime of tobacco use that began as he plowed fields with a mule in the 30's, and was radically born again and filled with the Holy Spirit during the early days. He says he would sit down and find hours had passed without ever looking at his watch..the worship was so heavenly and even experienced joy unspeakable and laughed all night after one meeting. Thank you so much for sharing this testimony David! We glory in the wonderful blessings in the past ... and anticipate what is yet to come! You are welcome, Archibald! 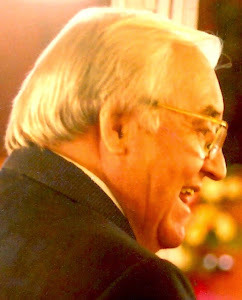 I thought my first hand experiences raised in a Full Gospel Church pastored by Mom Beall would have a lot more weight than a critic who never attended or encountered congregational worship at Bethesda, much less the Prophetic Laying on of Hands that was a hallmark of this outpouring both in Canada and at Bethesda along with other "Latter Rain" churches. 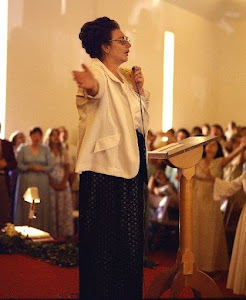 Mom Beall spoke for 15-20 minutes on Sunday mornings, as well as during the conferences that we held 3 times a year for a week when I was growing up. She was in a wheel chair in her latter years, and would sit quietly smiling down at the congregation throughout the service conducted by sons James and Harry. 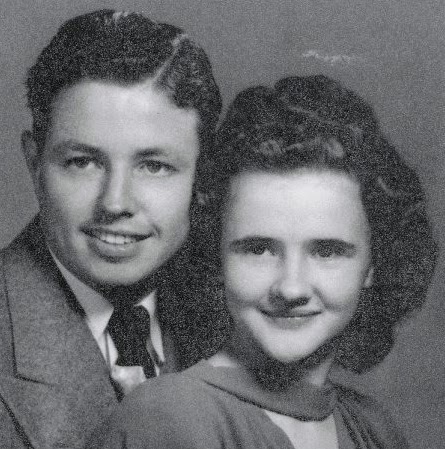 However as a boy I was always afraid to look her in eye, her prayers of deliverance over the congregation were so powerful as she shook her right hand downward, I felt she would see every sin I had committed that week, so repentance was regular as we knelt at our seats to cry out to God at the close of most meetings. I laughed out loud when I read your statement above that "Latter Rain teaches over-comers will become Immortal (Gods on Earth). 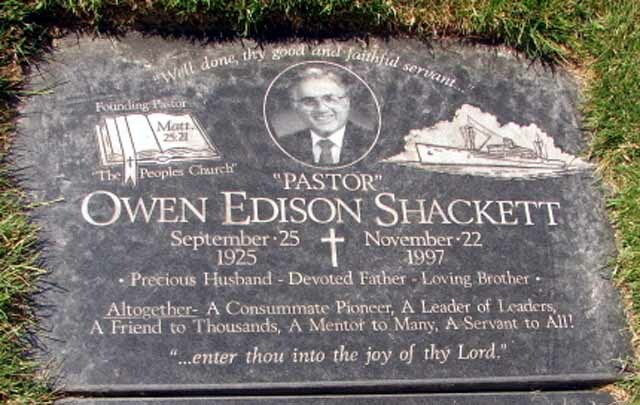 In 34 years attending Bethesda Missionary Temple several times a week and twice on Sunday, I never once heard any teaching about becoming "Immortal". 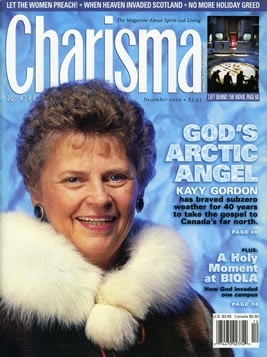 I do remember kneeling to repent regularly after sermons by Mom Beall, Patricia Beall Gruits, James Beall and many others, and remember Mom Beall's preaching on Revelations and the horsemen and the seals made you want to be ready whenever Jesus appeared in clouds to take His Bride to Heaven...I do know that the 9 month weekly course Understanding God teaching for all adults and teenagers was required to apply for membership, and each student had to be certified by their counselors that they had truly experienced the foundation stones of Hebrews 6:1, not only repenting, but water baptism and Holy Spirit baptism with the evidence of speaking in tongues. 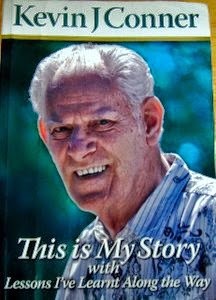 I not only took the course when I was 12, but heard it taught for 6 straight years by Patricia Gruits when my wife Regina and I worked as counselors with our own small group of 10 students who we came to know very well and watched the change in them by hearing sound doctrinal teaching, as the Holy Spirit bore witness and they were baptized by Jesus into the Spirit the same as on the day of Pentecost. 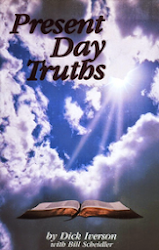 None were ever taught to become Immortal, they were taught that what is born of God does not sin, of course they were also taught that the inborn iniquity needed to have the root cut, and hopefully buried the Old Nature in water baptism. The spiritual change was so complete that over 50% would break into tongues the first time we led them in worship the night they were water baptized, which was usually in January, and the rest would break through in the coming weeks as we led them into worship and praise and laid hands on those who had not yet spoken, but were obviously born again, anointed by Christ, and were wanting the fullness of the Spirit in their lives. I only actually remember 1 student out of about 600 in my years who completed the course, but never experienced speaking in tongues and was not actually confirmed in the faith on graduation day (she sat with her class but was not confirmed). 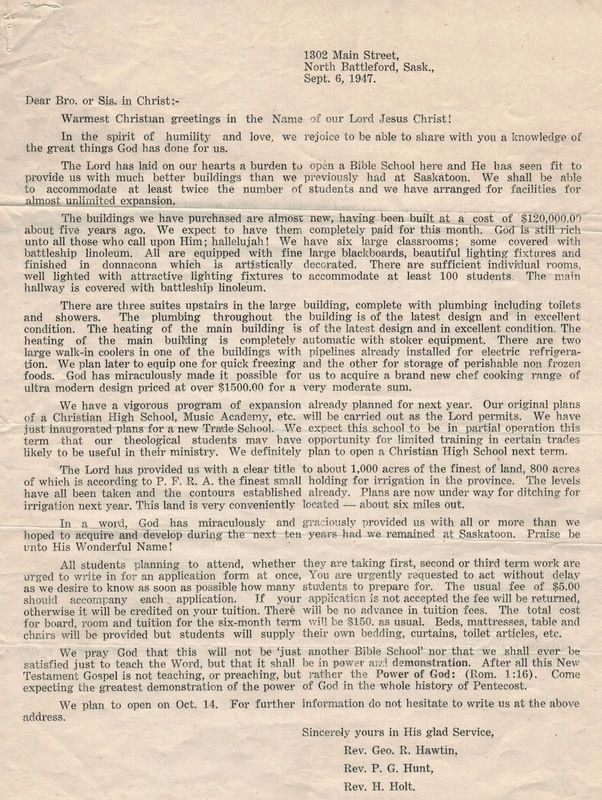 Some may have faked it to graduate, but it was the counselor responsibility to certify that they were ready to now take communion with the adults for the first time, and would be fully accountable before God for what they did with the gift of the Holy Spirit who had taken permanent abode. I also attended Mt. Zion Temple for 5 years from 1985 to 1990, and will make some very positive comments regarding both the healing ministry and Pastor Loren's anointed preaching while we attended with our 3 daughters. I actually attended Mt. 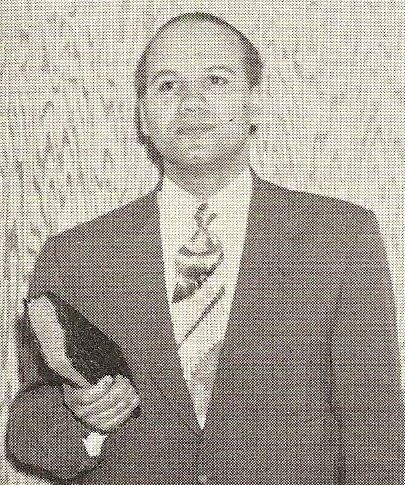 Zion from approximately 1990 to 1995, and was part of the choir along with Edward Stingley and my brother in law Cliff Pershing. Other friends started attending at about the same time, Jeff and Teresa Steinke and Ron and Phyliss Danielson. Your first-hand reminiscences are a welcome supplement to what I have written on this site. 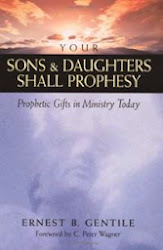 Particularly meaningful to me are your remarks about Mom Beall and your experience of being used in the gift of prophecy. I have tried to faithfully report research about this movement, and you are helpful in filling out the picture from your first-hand experience. I will be looking forward to your comments about Mt. Zion. 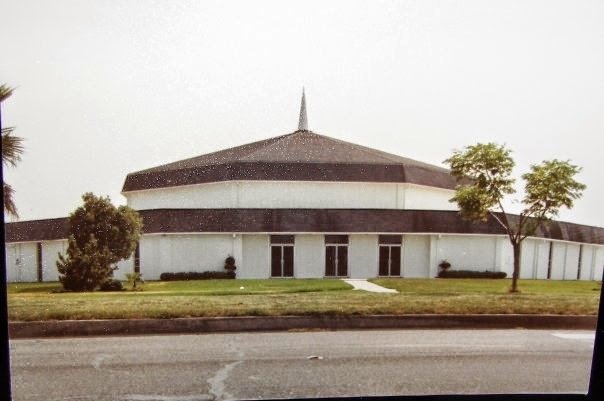 I will be forever grateful for the Biblical teaching and Spirit-filled preaching I received at Bethesda Missionary Temple. Before my family came to Bethesda, I was hungry for more of God but didn't know He had so much more for me. It was at Bethesda that God opened up His vast storehouse and poured His Holy Spirit into our lives in such a sweet and powerful way. 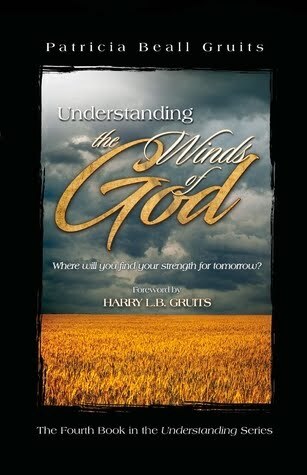 Thank you Mom Beall for following Gods instructions and for giving me an increased understanding of His Word. There are many of us who miss your beautiful spirit-filled words. 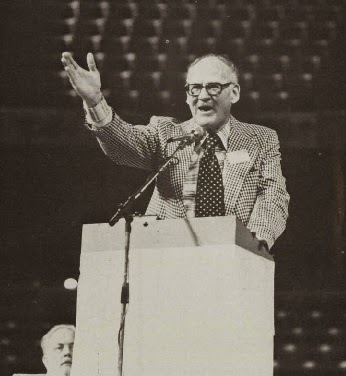 I not only remember Mom Beall's piercing sermons and prophetic utterances until I moved to Tennessee in 1984, but I remember James Beall giving words of knowledge from the pulpit about healing to the congregation, and he was also a regular prophetic voice to the congregation, along his brother Harry Beall and his wife Patty, Patricia Beall Gruits, Gilbert Francisco, Paul Stern, Manley Higgens (former missionary to Africa), Art Hittenberger, Frank Laouni, just to name a few. Actually, so many people delivered words of edification, exhortation and comfort that were always recorded as part of the service, it is impossible to list all that participated because they would number in the hundreds. Would you like to know?" I believe he has led literally hundreds to Christ the last 30 years, and has approached thousands as a one man evangelist team. 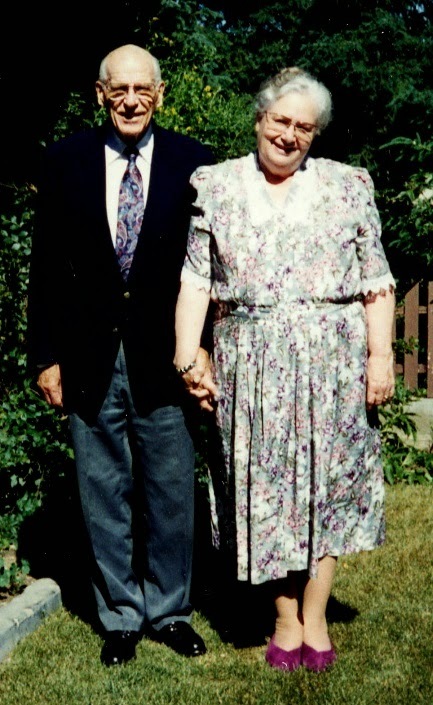 If you multiply the thousands like Dad and Mom who were born again and filled with the Holy Spirit and have lived their lives as James Beall put it, "living epistles read of all men", the impact of Mom Beall's conversion and ministry that began as a Sunday School for children in 1934 on Nevada and 7 Mile in Detroit is in the millions of lives worldwide, too numerous to count. 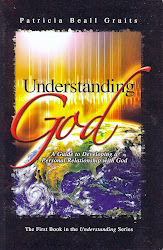 If you add in the worldwide impact of Patricia Beall Gruits and her "Understanding God" training for new believers we called the Cateshism which resulted in Baptism of Water, and the Holy Spirit with evidence of speaking in tongues and other gifts imparted with the fullness of the Spirit which has been translated into dozens of languages around the globe, then the number of lives affected by the Beall family could easily be in the hundreds of millions. My wife Regina and I were Catechism counsellors and worked directly with Patricia Beall Gruits for 6 years in Detroit prior to our move to Tennessee in 1984 and can attest first hand to the deep work of the Holy Spirit in the lives of these 12 and 13 years old boys and girls from Detroit and surrounding suburbs. 99.99% who completed the 9 month course were truly born again, and filled with the Holy Spirit after the circumcism of heart experience in water baptism, where the old nature was buried with Christ. 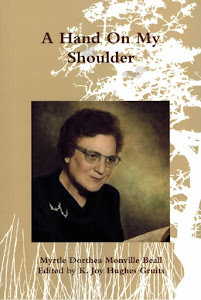 Of course, I had many years preparation for this responsibility working with Mom Baer, who pioneered Bethesda from it's inception in 1934 along with her husband Pop Baer who not only was the first male member but remained the church treasurer until he passed after many years of service. 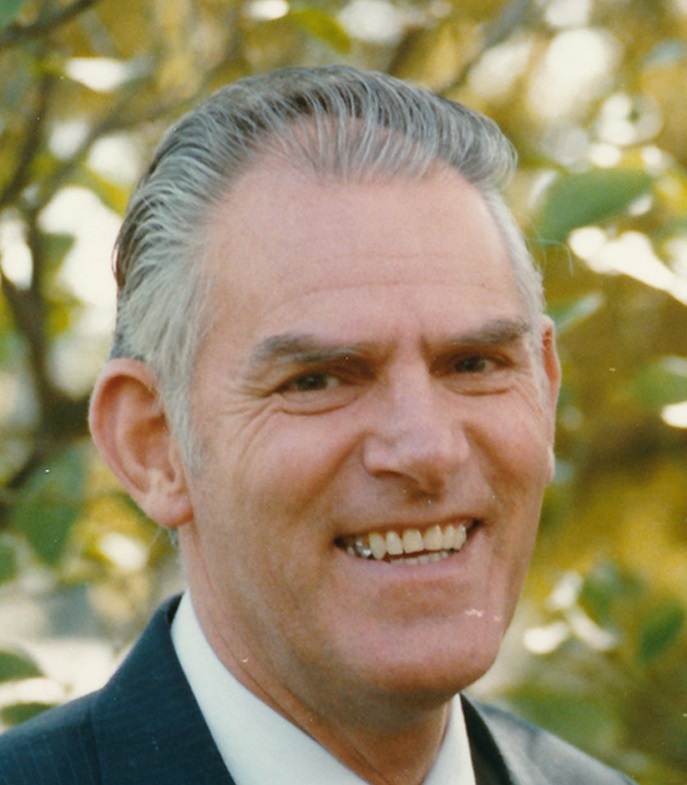 Pop Baer was also the founder of Crown Enameling, which is run by his two sons to this day and which has grown into many industries as God blessed his business and his children. 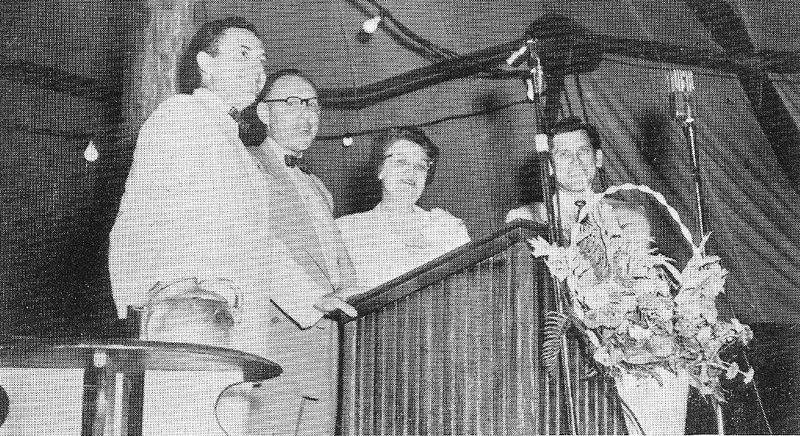 Mom Baer was the leader of the intercessory prayer group that prayed daily for 7 years from the bombing of Pearl Harbor until the outpouring in 1948 that began just before the completion of the new auditorium that seated 2,200 people, and was filled to overflowing from the very first service. 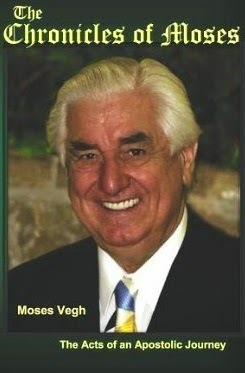 Mom Baer was my spiritual mentor, and I not only attended her prayer meetings as a child with my Mom, but when she appointed me president of our Friday night youth service inn 1968, I was able to see first hand how a word is birthed and delivered, how to prophecy under the anointing, how to impart the Holy Spirit to a hungry heart, and how to preach a word from the Lord to our 200+ youth group on Friday night. I remained as the leader of our group of youth counsellors after getting married and stepping down as president, training Dan Mastro to take over as president. 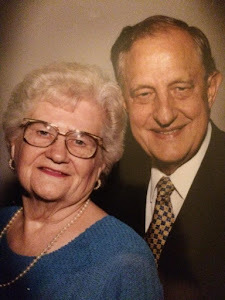 One of my team of counsellors was Annalee Beall Dunn, the current senior pastor of Bethesda Christian Church, the name adopted when the church moved to suburban Sterling Heights, several years after Mom and Pop Beall went home to be with the Lord. Dan Mastro is a full time pastor today, along with Annalee Beall Dunn. Most of our team of workers and counsellors are still serving the Lord today, all impacted as I was by Mom Baer as she was training us to know God's voice and how to pray and yield to the Holy Spirit. She had a heart for the youth, and even in her 80's was young at heart, and prayed earnestly for each of her proteges to fulfill God's call in their life. 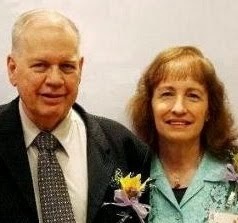 Archibald, I have posted this site to all my Facebook friends, many who have first-hand experience with Bethesda Missionary Temple as members when it was pastored by Mom Beall and her son James Beall who is also deceased. 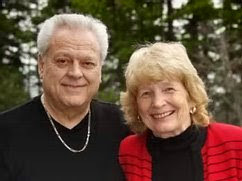 Many of us still have contact with former pastors Harry Beall and Patricia Beall Gruits or their children even though we attend different churches and live across the country. BTW...You are correct that not a single service man or woman was lost during all of WWII as the intercessory prayer warriors led by Mom Baer and others prayed daily for each one by name. What you may not know is that this same protection was extended to the Korean conflict and the Vietnam War, and if you add them all up they total in the hundreds! 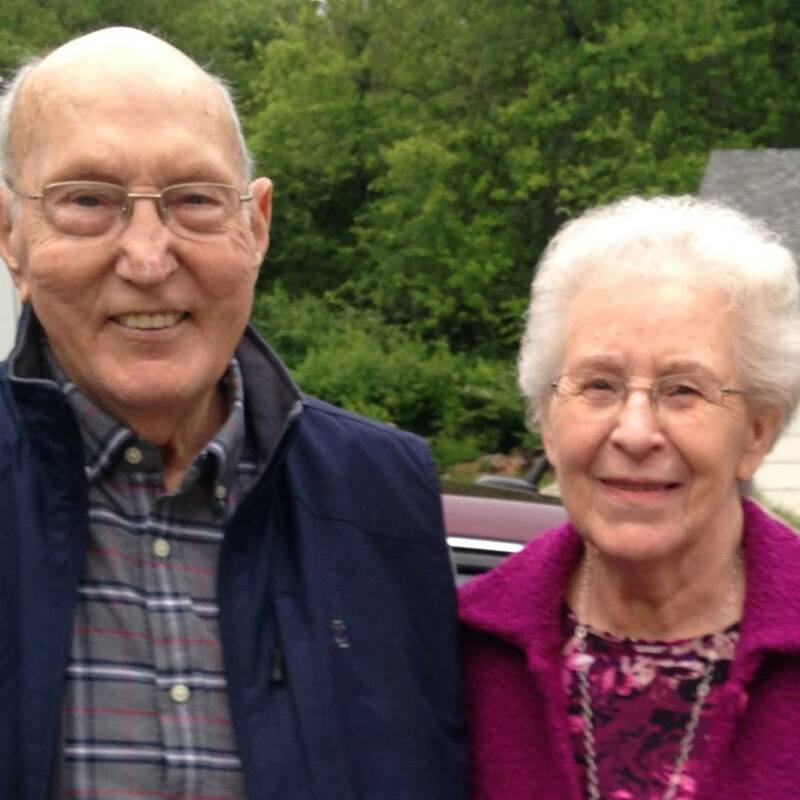 I had one friend named Walter Wordell who was a high school ROTC leader and one of the toughest guys I ever knew... Walter had a praying mother who was part of the church intercessory prayer group. She told me that he wrote home about of some of his amazing experiences as a sargent of a recon team in Vietnam, that could only be explained by angelic interventions..
Walter never lost a man and sustained only minor injuries during his year on the front lines where the life expectancy was short for most men. 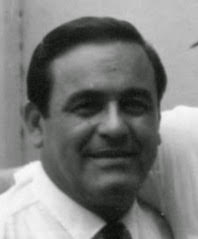 Walter was promoted and brought back to California and made a top sargent and helped prepare new recruits before they were shipped out to Vietnam for his last year of service. 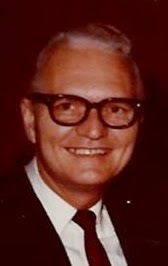 He never spoke of his time in Vietnam, but did become a lifetime insurance agent and member of Bethesda Christian Church even though in his teens and early years as a newly wed he was not much for church...but the foundation laid as a child and prayers of his mother and his miraculous escapes in Vietnam were undeniably God at work! Thank you Brother David for making your friends aware of this site. And as I mentioned previously the effectiveness of this site is being enriched by your much-appreciated first-hand accounts of what happened at Bethesda. 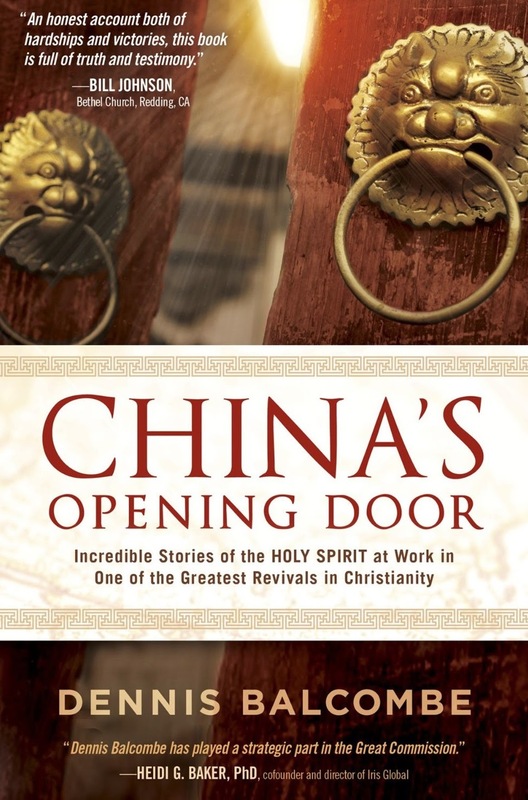 For those who did not experience the tremendous move of God at Bethesda like you did, I strongly recommend the CD that is promoted in the right-hand column of this website. 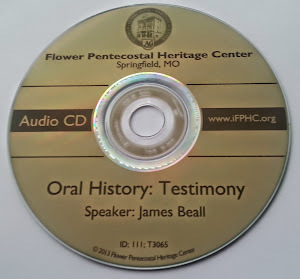 I am speaking of the CD which features James Beall telling the history of Bethesda. 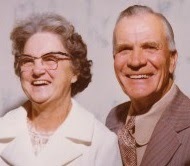 I wept at times just to hear about the awesomeness of our Lord and how he used his obedient servant Myrtle Beall. 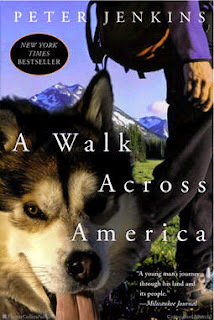 I also laughed heartily at moments because James Beall told the story so humorously and well. 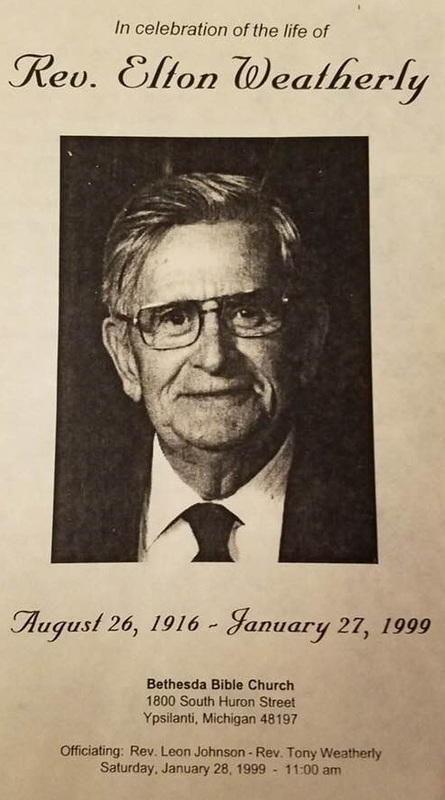 Archibald, I truly appreciate all the work you have done to bring together so many facets of the history of Bethesda and M. D. Beall, who we called Mom Beall, or Sister Beall. 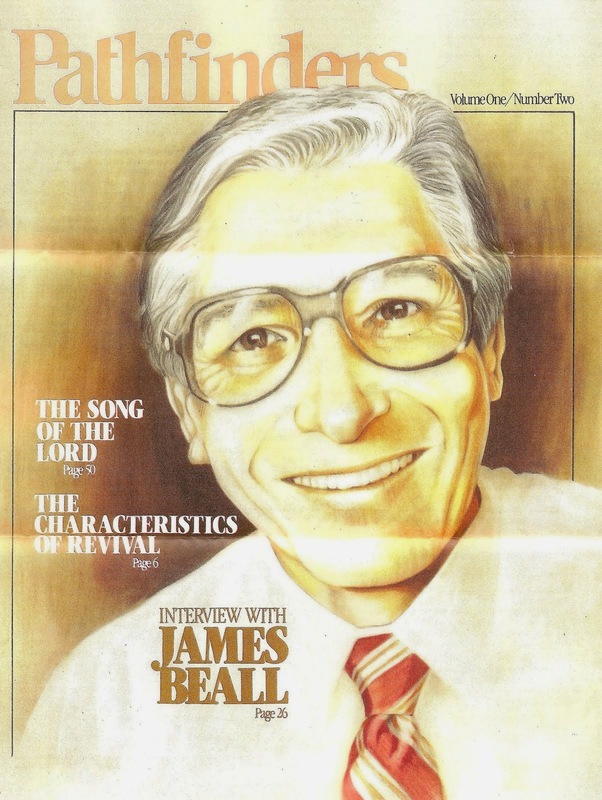 James Beall was always Brother Jim, it was like a big family. Incidently, Johnny Beall and I were the same age, so we played baseball on the pee wee teams as children, and on the church basketball team in our teens. 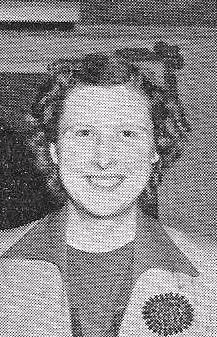 Ann Beall was our Sunday School teacher in the 12th grade, and she and husband James chaperoned our graduating class of boys and girls in a train trip to New York, where we visited Greenwich Village and saw the Rockettes at Radio City. I was pretty wild that year, so glad they were so understanding. 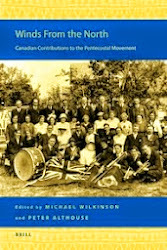 The information I am reading here is causing me to reflect on the rich heritage we had sitting under the ministry of Ern Baxter, Violet Kiteley, Ernest Gentile, who I had almost forgotten until seeing them here on your blog. 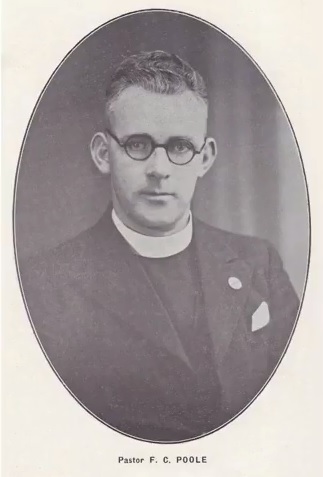 Stanley Frodsham I never met, but my parents told me how he prophesied to Mom that the child she was carrying in 1949 would be a boy and would grow up to preach the gospel. 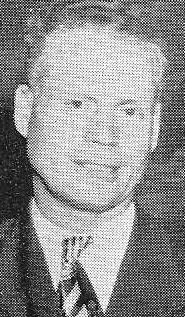 Dad was very impressed by Brother Frodsham, as well as William Branham who he saw minister, and gets very excited when he tells of how the Holy Spirit showed up at his meetings. I don't bother to read a lot of lecture/teaching by people who try to convince folks that churches like Bethesda and Mt. Zion are unscriptural in their teaching, because the proof is in the pudding, so to speak. The Holy Spirit imparts gifts when He comes to fill a yielded vessel to overflowing as evidenced in part by speaking in tongues, for I am a personal recipient of the infilling and giftings, as were many of the 600 children that went through the Understanding God course in the 6 years I was a counsellor. We saw that after following the pattern of Hebrews 6:1," Repentance from dead works, Faith towards God, Doctrine of Baptisms( water, Holy Spirit, fire), Eternal Judgement and Resurrection of the dead" the children were not only able to speak in tongues, but they could many times prophesy words of edification, exhortation and comfort after being sealed by the Holy Spirit, the earnest down payment of heaven now residing in an earthen vessel. Just as Jesus told his diciples, " You shall have power after the Holy Spirit comes upon you", so children and adults have always been able to move into the supernatural power of God naturally after the Person of the Holy Spirit comes to be our Spirit guide. It was that way with the 120 on the day of Pentecost, and it has not changed today. 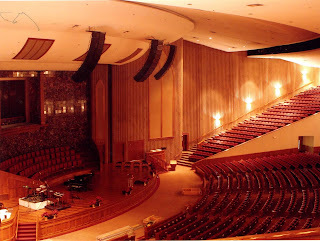 BTW...In my 34 years of weekly attendance at Bethesda from my birth there in 1950 till I moved to Tennessee in 1984 I do not recall a sermon by Mom Beall or Mom Baer or their childen about "The Manifested Sons of God" or anything remotely close to that topic. 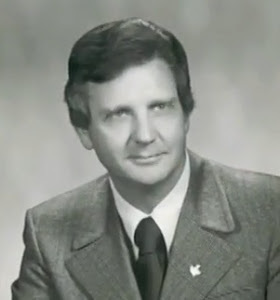 I know there were other ministers like Bill Britain (spelling may not be accurate) that never ministered at Bethesda that might have taught in that vein, my mother in law Inez Duncan saved old cassette tapes of his teaching, along with hundreds of others from Bethesda so I am somewhat aware of his extreme doctrinal beliefs, but none of it was part of Bethesda when I grew up. The most controversial teaching of Bethesda was the water baptism formula for the cutting away of the Old Man and Iniquity that swept the entire church in the 60's. I watched weekly as virtually every member was baptised with this teaching and revelation, as we went from the orthodox words of, " In the name of the Father, Son and Holy Spirit", to actually using the name 'Lord, Jesus, Christ". 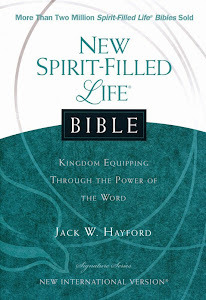 Many called us "Jesus only", which was and is a total mis-characterization of the understanding that Jesus is God, and came to baptize his disciples in the Holy Spirit, who is still part of the Godhead, but in a form that brings the Power of God in our lives to overcome sin, sickness and disease so that we might truly overcome by the Blood of the Lamb and the word of our testimony, which is the spirit of prophecy working in us to preach God's Word to a lost and dying world. Every pentacostal or charasmatic I have ever known prays for the sick or casts out devils in the name of Jesus, never Father, Son and Holy Spirit. 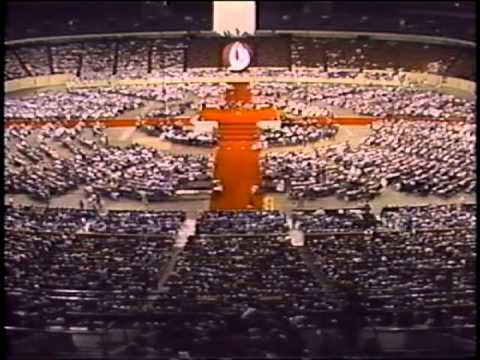 We are born again when we accept Jesus as Lord and Saviour, and can then be filled with the Power of the Holy Spirit just like Peter on the day of Pentecost when he went from one who shamefully denied Christ 3 times...to the one who preached fearlessly and saw thousands repent and follow Jesus the Messiah in one day! David, is it possible that Mrs. Duncan would be willing to sell any of her collection of Bethesda tapes? 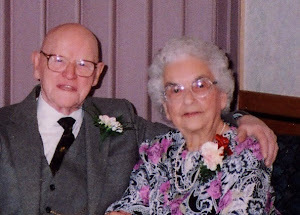 Archibald, I will gladly share her collection with you, she went home to be with the Lord 20 years ago, plus I have items my mother collected as well. I can scan photos and post them, but caring for my disabled wife Regina 24/7 the last 4 years has taken up most of my time and energy. What if I converted cassette tapes to audio files that can be burned on a CD? Would people be interested in something like that? Wow! That is fantastic, David! The photos ... the audio files ... it would all be so very much appreciated. And please, take your time - it will be well worth any wait. I was blessed to have grown up in Bethesda. I had the pleasure of hearing Mom preach. I can still hear and see her in my mind. In 1978 I joined the sound crew and spent nearly 30 years on it. I also had the pleasure of working for the Church full time for a period of my life. 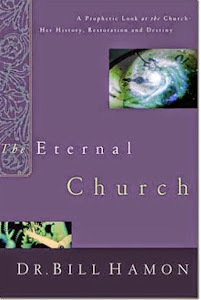 Bethesda taught me many things not just about God but helped me in my career outside the Church. 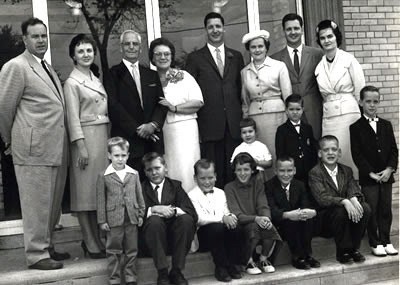 I miss the Beall family, they were more than just Pastors and my employers. I would not be where I am today without them. Glad to here about the forthcoming documentary, Lee! Also, I have sent an email reply to your query.